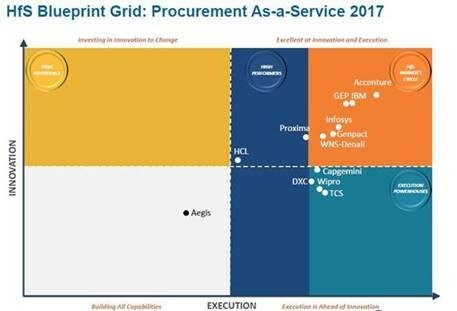 As stated in the report, ahead of all competitors, Accenture is the leading-edge provider of Procurement As-a-Service offerings, exhibiting great breadth, depth, and vision for the future of procurement. HfS highlights Accenture’s expanding use of intelligent automation in procurement, its ability to integrate proprietary tools and platforms together, and its investments in partnerships and management tools. As-a-Service capabilities. Accenture is advocating an As-a-Service approach to procurement outsourcing that allows clients to select the skills and technology needed to more effectively integrate into their retaining procurement functions than has traditionally been the case. A true partner to clients. Clients emphasize the true partnership with Accenture as a key strength. The end-to-end process. Accenture leads the market in breadth, depth, and sophistication of its strategic sourcing and category management, and transaction capabilities with innovative specializations in fields such as energy sourcing, media and advertising, and logistics. Accenture combines deep expertise, platform, intelligence and analytics, and automation to drive outcomes across industrialized end-to-end procurement process. Excellent account management. Clients are quick to highlight their delight with account management, particularly citing responsiveness and proactivity. Committing to and delivering hard savings. Several clients are satisfied with the level of savings Accenture is willing to commit to and can deliver. They express confidence of Accenture’s ability to drive additional value for their organization. Innovation in delivery and commercial model. Accenture has moved all its contracts to fixed-fee constructs with a performance-based element and delivery on the Radix platform. Balanced client portfolio. Accenture has a balanced portfolio ranging from medium to large enterprises across most major industries. HfS analyzed the innovation and execution capabilities of 13 service providers who offer support across the procurement as a service value chain in strategic sourcing, supplier management, transactional procurement, technology, and contract management. The report also examined the evolving market as it continues move toward business outcome-focused, flexible, on-demand and collaborative changes. For a detailed Accenture POV on the future of digital procurement, click here to download the company’s insights.